$66.114 million on 3359 screens. Rated PG-13 for epic battle sequences and some scary images. Won for Best Cinematography; Best Visual Effects; Best Makeup; Best Score-Howard Shore. Nominated for Best Picture; Best Director; Best Supporting Actor-Ian McKellen; Best Adapted Screenplay; Best Sound; Best Art Direction-Set Decoration; Best Costume Design; Best Editing; Best Song-"May It Be". As this represents the third DVD release of The Lord of the Rings: The Fellowship of the Ring, I won’t spend a lot of time in a discussion of the movie. 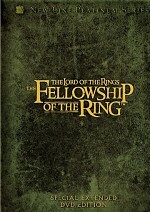 The first set presented the 178-minute theatrical cut of the flick, while the second package featured the 208-minute extended take of Fellowship. If you’d like to read my full thoughts on the two editions, go nuts and click the links above. In short, I thought the theatrical cut had some minor flaws, but overall it came across quite well, and it offered an exciting and rich experience. As for the longer version, I felt that the additions didn’t substantially change the movie. They fleshed out sequences and characters well but they didn’t provide any extreme variations. Unlike something such as The Abyss, the extra material didn’t alter the story or our interpretation of things. I viewed the new material as icing on the cake. The film works well in its theatrical cut, but these extended pieces make it just a little bit more satisfying. 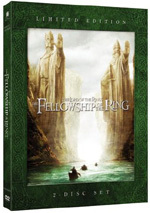 The Lord of the Rings: The Fellowship of the Ring appears in an aspect ratio of approximately 2.35:1 on this double-sided, dual-layered DVD; the image has been enhanced for 16X9 televisions. Overall, the picture seemed solid, with very few flaws on display. Sharpness appeared excellent. The movie always remained nicely crisp and distinct, and I noticed virtually no instances of softness or fuzziness. Jagged edges and moiré effects created no concerns, and I also detected no signs of edge enhancement. As for print flaws, the movie showed a wee smidgen of grain at times, but this remained very minor. Most of these small issues occurred during the scenes in Hobbiton; those displayed the film’s weakest elements, though they still remained generally positive. Otherwise, the image seemed free of any form of defects. Fellowship enjoyed a stylized palette that varied dependent on the location. For example, when we entered elf territory, the film adopted a heavily golden tone, and other climates might strongly desaturate the image. The colors always remained nicely vivid and vibrant, and they showed no problems related to bleeding, noise, or other concerns, even when we entered some red-dominated areas. Black levels came across as deep and dense, while shadow detail was appropriately heavy but not overly thick. Ultimately, the image of Fellowship looked pretty terrific. The extended edition of Fellowship integrated the new half hour of scenes neatly, and I never noticed any disruptive or awkward edits. The visuals appeared consistently positive for those segments, so I didn’t detect any decrease in quality. When I compared the extended edition with the original theatrical cut DVD, I didn’t witness any variations. Both showed very similar images and seemed equally positive. I also felt pleased with the Dolby Digital EX 5.1 soundtrack of Fellowship, though I admit the audio didn’t overwhelm me to the degree apparently experienced by others. I’ve read massive praise for the mix that I didn’t think it merited. Actually, the audio did overwhelm me, which was the problem. Bass levels went off the chart during much of the film, and I don’t feel that more is necessarily better. Fellowship poured on the low-end to an excessive degree, and it became a distraction at times. It seemed like every little noise pounded my subwoofer into submission, and this felt over the top and unnecessary. Some may love this emphasis on heavy bass, but it dissatisfied me to a small degree. Otherwise, Fellowship provided a very solid auditory experience. The soundfield offered a very wide and engaging piece. All five channels received active usage throughout the film, and they created a nicely vivid and life-like environment. Music showed fine stereo presence, while effects appeared from all around the spectrum. Those elements blended together neatly, and they moved cleanly from speaker to speaker. Surround usage was effective and accurate without becoming overwhelming or gimmicky. None of the film’s scenes stood out to me as anything particularly noteworthy, but the package mixed together to become a fine and seamless whole. Except for the heavy bass, audio quality seemed strong. Dialogue sounded natural and crisp, and I noticed no problems related to edginess or intelligibility. Music was bright and vibrant and displayed positive range; the excessive low-end became an issue only in regard to effects. Other than that factor, those elements appeared clean and distinct, and they lacked any signs of distortion. The overwhelming bass almost caused me to knock my grade down to a “B+”, but I felt the overall audio of Fellowship worked well enough to merit an “A-“. Should fans expect the picture and audio of this release to differ from its predecessors? I don’t think so. To my eyes and ears, the 2006 Fellowship looked and sounded virtually the same as the older DVDs. Only one extra shows up on this “Limited Edition” release of Fellowship. We get a new Behind the Scenes documentary created by filmmaker Costa Botes. This show runs one hour, 24 minutes and 49 seconds as it consists entirely of “home movie” footage from the shoot. It includes comments from extras wranglers Christina Hazard and Karl Kite-Rangi, director of photography Andrew Lesnie, director Peter Jackson, writer Fran Walsh, conceptual artists Alan Lee and John Howe, first assistant director Carolynne Cunningham, costume designer Ngila Dickson, 2nd assistant director Joanne Pearce, production manager Nik Korda, best boy Ants Farrell, greens master Brian Massey, Weta Workshop’s Mark Newnham and Richard Taylor, plane spotter Emma Simmers, construction supervisor Ed Mulholland, Elvish expert David Salo, assistant dialect coach Roisin Carty, head dialect coach Andrew Jack, swordsmith Peter Lyon, swordmaster Bob Anderson, New Zealand casting director Liz Mullane, horse master Harley Young, senior miniatures builder Mary MacLachlan, unit manager Richard Sharkey, visual effects DP Alex Funke, on set model technician Verena Jonker, 2nd AD Skot Thomas, on set art directors Simon Bright and Joe Bleakley, physical effects technician Geoff Curtis, 2nd unit director John Mahaffie, physical effects Steve Ingram, supervising editor Jamie Selkirk, editor John Gilbert, sound designer David Farmer, sound editor Tim Neilsen, digital models supervisor Matt Aitken, animation supervisor Randall William Cook, senior animators Andrew Calder and Matt Logue, texture painter Paul Campion, shader writer Robert Shrider, digital assist operator Anthony Sumich, unit assistant Missy Rika, producer Barrie M. Osborne, Weta art director Kayne Horsham, chain mail technicians Christopher Smith and Carl Payne, supervising sound editor Michael Hopkins, composer Howard Shore, re-recording mixer Christopher Boyes, and actors Dominic Monaghan, Billy Boyd, Elijah Wood, and Viggo Mortensen. The show looks at complications on locations, production design and sets, storyboards and animatics, issues related to the scale of the various characters, costumes, makeup, weapons and prosthetics, stunts and fight scenes, cinematography, speaking Elvish, extras and animals, miniatures, audio and music, digital effects, and various challenges. Don’t expect this program to offer a particularly coherent documentary that follows a logical course. It doesn’t spotlight the various subjects in a way that really details them. Instead, it sticks with a “you are there” feel to cover various aspects of the production. And it does that pretty well. I enjoy this sort of behind the scenes footage, and I like being able to view the shoot in this manner. On its own, the documentary satisfies. But since this “Limited Edition” is the third DVD release of The Fellowship of the Ring, it’s impossible to consider any aspect of it in isolation. After almost five years, the movie itself continues to entertain and enchant. It starts the trilogy well and creates a very vivid setting. The DVD looks and sounds very similar to the two prior releases. So who – if anyone – will want to buy this “Limited Edition”? Absolute die-hards will likely grab it to complete their collections, though I don’t think they’ll miss much without it. Does the new documentary tell us anything we don’t already know from the first two sets? Not really. A few interesting unique bits may emerge, but I don’t feel as though it taught me anything fresh about the film. For me, the four-DVD extended Fellowship remains the best of the bunch and the one I’d recommend to the majority of fans. The original two-disc theatrical cut would be my second choice, and this “Limited Edition” is my least favorite of the bunch. If you own no version of Fellowship and want the option to watch either the theatrical or extended cuts, then this one is a good choice. Otherwise, the earlier discs are more pleasing since they include more satisfying supplements. The 2006 Fellowship is a good product but not an essential purchase for Rings fans.